The win streak continued for the Allen County-Scottsville volleyball team. The Lady Patriots downed Franklin-Simpson 2-0 (25-15, 25-14), Edmonson County 2-0 (25-13, 25-22), and Westmoreland 2-0 (25-15, 25-19) to improve to 13-5 on the season. AC-S has won nine consecutive matches and 17 consecutive sets. The Lady Patriots broke to an early lead and never faltered in their first set against Franklin-Simpson. A kill by Macy Ward and an ace off the serve of Abigail Cooper staked AC-S to a 15-7 lead. Franklin-Simpson pulled to within four points, 16-12, before kills by Kaylee Baldwin and Chloe Cook ignited the final AC-S 9-3 run. 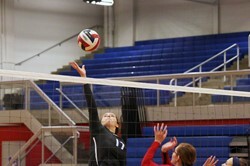 Franklin-Simpson led 11-9 midway through the second set last week only to see the Lady Patriots charge back. The serving of Olivia Brown and a winner from Baldwin lifted the hosts to a 16-12 lead. Winning shots by Meg Foster and Baldwin, a pair of ace serves from Ward, and a late kill off the hands of Jaden Carter enabled the Lady Patriots to complete a 16-3 run and take the match. The story and patten was much the same against Edmonson County at Patriot Gym on Thursday. With Avery Pitchford’s serves starting the match, AC-S jumped to an early 6-0 lead. Sets by Foster led to kills from Cook and Ward enabling the Lady Patriots to build a 15-6 first set lead. The Lady Patriots continued to be on their game closing out the first set to win by 12 points. The second set was not a thing of beauty. The Lady Cats broke open early ties and grabbed an 11-8 lead. Settling down, AC-S rallied, tying the set at 11 on a service winner by Ward. The set went back and forth before kill shots from Baldwin and Cook lifted the Lady Patriots to a 19-15 lead. A late charge by Edmonson was repelled by kills from Bre Varner. AC-S would win the set 25-22. Monday, the Lady Patriots controlled the tempo against the Lady Eagles from Westmoreland. Staying with their game plan of solid serving, strong net play, and good communication, AC-S took the first set 25-16. In the second set, the Lady Eagles refused to fold, playing a strong game before the hosts closed the match with a 25-19 win. AC-S (13-5) is slated to host Barren County (11-10) Thursday and welcome Clinton County (11-1) next Monday. The Lady Bulldogs defeated the Lady Patriots 2-1 in a match early in the season in Albany. Tuesday, the AC-S will travel to Warren East (13-9), another team that holds a win over AC-S this season. The Lady Patriots will host Glasgow on Thursday, September 20 in what’s being labeled as “Pack the Stands” night at Patriot Gym.